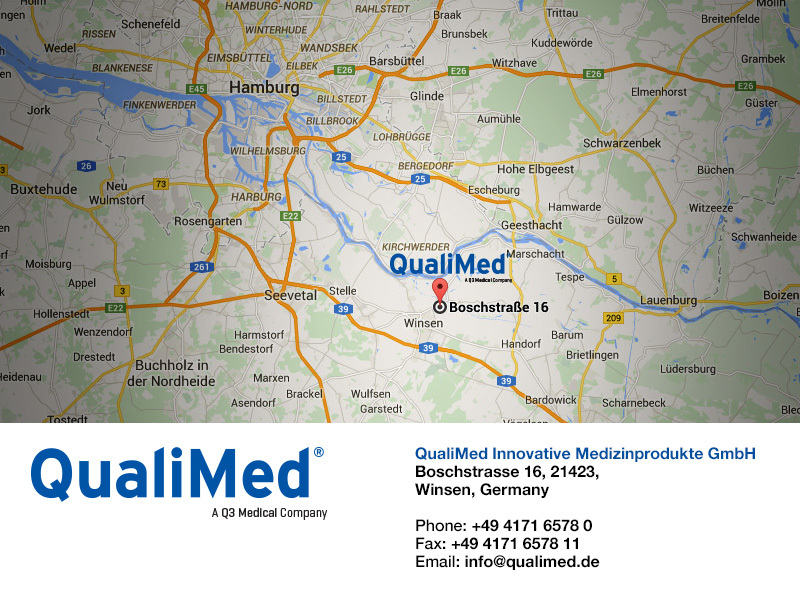 QualiMed was founded in 1997 as an OEM manufacturer for implantable medical devices with a focus on the development and regulatory approval of coronary stents and their respective delivery devices. Later the business was expanded to peripheral vascular and non vascular implants. In the last years QualiMed started with the development of various biodegradable technologies, drug device combination products, and micro-intervention implants as part of its diversification and competitiveness strategy. Up to date QualiMed has obtained CE approvals for more than 70 different products. QualiMed has developed over 4 Drug Eluting Stents of which it has two (2) CE approvals utilizing bio stable polymers and one more based on a proprietary fast absorbing biodegradable polymer coatings entering the commercialization phase. Manufacturing is organized outside of Hamburg Germany in the town of Winsen where QualiMed runs two Class 10,000 Clean rooms according to EEC GMP standards. The company has production capabilities for stents, catheters, drug device combination products, and biodegradable technologies for a variety of interventional and surgical applications and holds more than 70 patents and utility models World Wide. In 2008 Eric K. Mangiardi joined the Board of Directors at QualiMed as an active investor with a primary focus to assist the company in the development and implementation of its strategic plan, operational growth, and product diversification strategy. Mrs. MARTINA SCHMITT is Managing Director and Partner at QualiMed and is responsible for the manufacturing plant and leads the Operational activities at QualiMed. Her focused expertise is in the areas of plastics and all catheter based projects in the company. Before QualiMed Mrs. Schmitt expertise was primarily in the installation and management of production facilities at Devon Medical Hamburg, Germany and the establishment and growth of an OEM-testing laboratory at EDAG AG. Previous to that she held executive positions in the automotive industry with a focus on materials technology. ERIC K. MANGIARDI is currently the CEO of Q3 Medical Devices Limited. He joined the boards of Qualimed and AMG as an active investor with a focus on strategic planning, operational growth, product development, business development, and financial management. Mr. Mangiardi has held various senior positions in the Medical Device and IT industries, including President & CEO, Alveolus, Inc., Director of Corporate Strategy/Business Development (Healthcare), Atlas Commerce, and Regional Director, United States Surgical Corporation. He holds an MSc in International Marketing from the University of Strathclyde, Glasgow, Scotland and BSc. in Finance & Marketing from the University of Dayton, USA. MANFRED GUELCHER is currently the Chief Risk Officer at Q3 Medical Devices Limited. Former he was a founder at Qualimed GmbH and Co-Managing Director with responsibilities for regulatory, quality, drug device combination technologies as well as EU funded R&D cooperation projects and some of Qualimed developments of innovative strategies in cardiac treatment like myocardial regeneration by retro infusion and Nanopore elution projects. Previous to founding Qualimed, Mr. Guelcher worked as manager for quality and regulatory affairs at Devon Medical, Hamburg , Germany, and as an auditor for medical devices at DEKRA (notified body), Stuttgart, Germany.